Work of art statement: The character represents hope… Therefore you read the piece, “dreams with hope”. We all need to have them… All these ways of travel play roles in our dreams yet the real dream is simply adding up all the little pieces to reach the ultimate…. 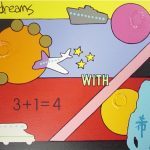 The blue area in this piece represents the water for the ship and the sky for the plane … Realize that often our dreams are so mixed together that we miss them.. It’s all there… 3+1=4 Simple addition right….. This piece was donated to the Dr. Herbert C. Jones Jr. Reproductive Health and Education center located in Charlottesville, Va.